When you’re speaking to a crowded room, school audience or outdoor event, the person speaking can easily be completely drowned out by just the ambient background noise. That’s when a portable voice amplifier comes in real handy (Source). These speech assistance devices equip you with a public address system clipped to your belt. Portable voice enhancers are small units, but pack a lot of punch with the quality sound that they deliver (Source). 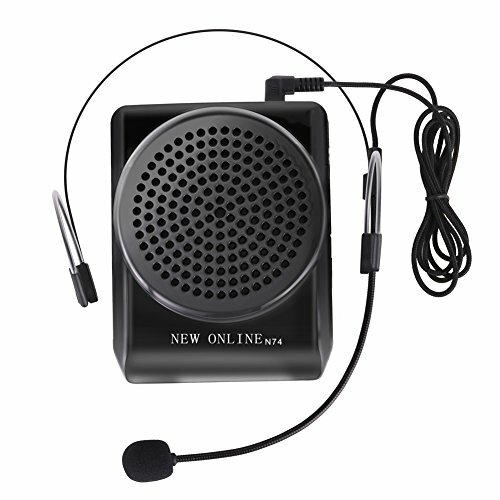 These speech amplifier systems are simple and consist of a small amplifier with a built in speaker that clips onto a belt and a portable, light weight headset. 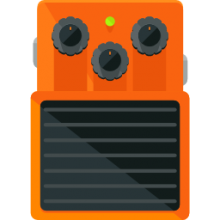 There are even voice amplification apps you can download for iPhone and Android. All the brands of speech amplification devices we examined are designed for easy one hand operation and come with a rechargeable lithium battery (Source). Simply plug in the headset, clip it to the belt, turn it on and you’re ready to comfortably speak to a large, crowded room. The amount you’re going to spend on the unit really comes down to volume. Units that pack higher amperage are going to cost you a little more. But, overall, most are in a price range that makes them affordable to any user. 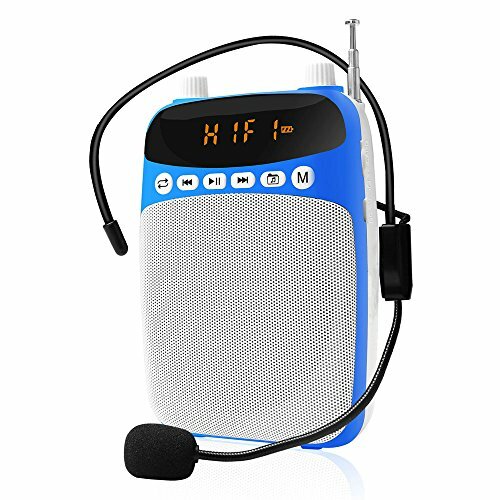 Choosing a portable voice amplifier really comes down to features, battery charge life and type of speaking conditions. The WinBridge WB001 is a top selling brand of portable amplifier and it’s easy to see why. The Winbridge WB001 is easy to operate, because of its top mounted buttons that make turning it on and adjusting volume a snap. The ETvalley is a winner, because of its extremely lightweight design and long battery life. The ETvalley can produce a decent sound for up to 15 hours. Another popular choice would be the Croove Mini Voice Amplifier. Although it only has a 10 hour battery charge before it needs recharging, its powerful amplifier boasts 4,300 square foot coverage, which gives you the confidence for large room speaking without a worry. The GHB Voice Amplifier has a battery life of about 12 hours before it needs a full recharge and is known for a tone that is soft and pleasant to listen to. This unit doesn’t knock you out with an earsplitting sharpness, making it a popular one with teachers. Looking at the DinoFire Voice Amplifier, this is a great one for everyday use, because it also has multiple functions. The DinoFire is not just a voice amplifier; it also features an FM radio and an mp3 player, which most other brands don’t offer. Really, the brand and type of voice amplifier a person goes with comes down to the type of usage. Winbridge, Croove and ETvalley are great for the large speaking hall or room. Croove has the edge on this with the actual square foot coverage. The GHB and DinoFire are better suited for modest square footage coverage of more of a classroom or small lecture hall. The biggest plus with these units is their soft tone which makes them best for conditions like a classroom, but they just don’t pack the volume punch of some of the other units. This voice amplification system offered by WinBridge is well-design, light, and rechargeable. Users love that the speaker can play music from TF cards and flash drives, but some do note that it’s not as loud as they expected. 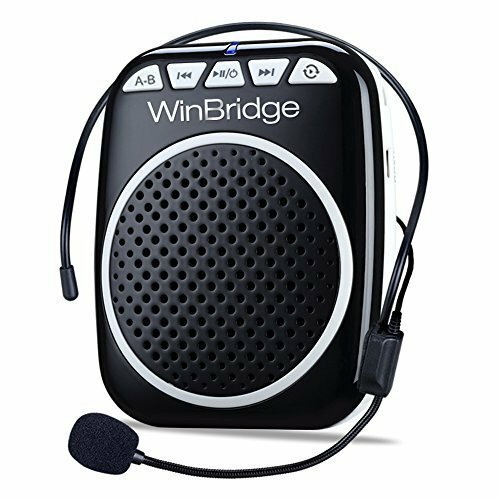 The WinBridge ultralight portable voice amplifier measures 7.4” x 5.9” x 2.7”, and it features an adjustable headset microphone, a belt strap to attach the speaker, user-friendly controls, and a weight of 11.2 ounces. Another great thing about this product is that it has a built-in rechargeable lithium battery which lasts around 5-8 hours and fully charges in 3-5 hours. A reviewer comments that he used the WinBridge portable voice amplifier during a presentation and that he was very pleased with the results. He adds that the device worked for a full hour on a maximum volume and there was plenty of battery left. Another user mentions that this one of the best rechargeable voice amplifiers for teachers and that it works perfectly. A user also states that there was no static or background noise when he used the amplifier and that it’s perfect for those who don’t want to raise their voice. However, some customers have said that there are no clear instructions and that the voice amplifier doesn’t last very long before the sound gets scratchy. If you have a quiet voice and people can’t hear you, then you might take a look at this personal voice amplifier offered by ETvalley. Users love that there is a green LED light to indicate when the battery is charged, but some do note that they had issues with the sound. The ETvalley portable voice amplifier measures 4.1” x 3.4” x 1.4”, and it features a rechargeable lithium battery, an adjustable band to attach the device to your waist, a headset with a microphone, and a weight of 8.8 ounces. Another great thing about this product is that it comes with a charger and an audio cable. A reviewer observes that the ETvalley personal voice amplifier produces a clear sound and that the headset is comfortable and light. He also notes that it lasts for several hours when fully charged. Another buyer mentions that the voice amplifiers is of invaluable help when he has to teach large groups and that people at the back of the room don’t have trouble hearing him. He highly recommends this voice amplification system for teachers. A user also states that the amplifier arrived in perfect condition and that it’s comfortable to wear it around your waist. However, some customers have said that the device is not loud enough or that it failed to work after a couple of months. 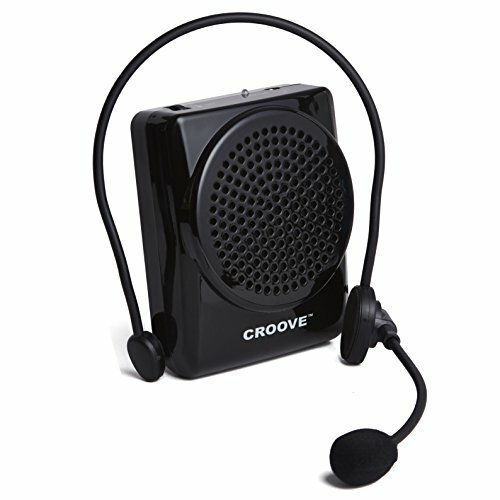 This rechargeable voice amplifier offered by Croove is well-made, portable and comfortable to wear. Users love that the device runs up to ten hours without recharging, but some do note that the headset is bulky. Croove personal voice amplifier measures 3.3 x 1.4 x 4.1 inches, and it features a built-in lithium battery, LED green charge indicator, an adjustable waistband, a removable belt clip, a comfortable headset, and a weight of 1.1 pounds. Another great thing about this amplifier is that the sound covers large areas, which makes it perfect for teacher and lecturers. The package also includes an MP3 AUX cable. As a whole, buyers have a favorable opinion of the Croove portable voice amplifier, and they are pleased with its performance. A reviewer observes that the headset fits around his head securely and that the sound is clear and audible. He adds that as a dance teacher he finds this rechargeable personal voice amplifier user-friendly and easy to operate. Another purchaser states that the amplifier has made her job as a teacher easier because she doesn’t have to stress her vocal cords anymore. A buyer also shares that he loves the voice amplifier and that he uses it daily with no background noise present. However, some customers have said that the personal voice amplifier is not loud at all and that they are disappointed by the quality of the sound. Some users, including one who purchased it for a Parkinson’s sufferer, also note that it stopped working after a few months. If you are looking for a way to be easily heard in a large auditorium, then you might consider this portable voice amplifier offered by GHB. Users love that the battery lasts up to 12 hours, but some do note that they had issues with the charger. The GHB personal voice amplifier measures 9” x 7.4” x 2.1”, and it features a hanging ear type microphone, an adjustable elastic waistband, a built-in lithium battery, and a weight of 1.1 pounds. Another great thing about this device is that it amplifies your voice without distortion over 4000sq m. The package also contains an audio cable and a charger. A purchaser states that the GHB portable voice amplifier is not heavy at all and that you can carry it comfortably around. She adds that it amplifies her voice very well and that her students don’t have any issues hearing her. Another use mentions that the amplifier is easy to set up and that there are plenty of volume levels at your disposal. A buyer also observes that the voice amplifying device works perfectly and that it’s ideal for birthday parties or people who have hearing problems. However, some customers have said that the volume is too low and that the amplifier stopped working after a couple of times. This personal voice amplifier for teachers offered by DinoFire is multifunctional, reliable and well-made. Users love that the sound is loud and clear, but some do note that there are no clear instructions. The DinoFire voice amplifying device measures 7” x 5.6” x 2.2”, and it features a rechargeable, built-in lithium battery that lasts up to 12 hours, a wristband, a wired microphone, and a weight of 1 pound. Another great thing about this amplifier is that it has several modes available– record, FM radio, aux, and MP3 player so that you can listen to music from your smartphone. A customer mentions that the portable voice amplifier is perfect for a classroom and that it’s lightweight and comfortable to wear. She adds that she speaks very quietly and thanks to the amplifier her students can hear her instructions. Another reviewer observes that it takes some time to get used to the microphone, but the speaker does an excellent job. She highly recommends it as the best voice amplifier available and adds that she would gladly buy another. A user also comments that the voice amplifier works better than she expected and that it’s invaluable help for those with soft voices. However, some customers have said that the device is too quiet and that it’s not suitable for a noisy environment.